R.J. Hodgkiss, (1979), Characterization of purine analogue resistant variants of V79 Chinese hamster cells, PhD Thesis, University of Manchester Faculty of Medicine. R.J. Hodgkiss, J. Brennand and M. Fox, (1980), Reversion of 6-thioguanine resistant Chinese hamster cell lines, agent specificity and evidence for the repair of promutagenic lesions. Carcinogenesis, 1, 175-177. R.J. Hodgkiss and M. Fox, (1980), Characteristics of revertants induced by EMS and UV light from a break 6-thioguanine resistant HGPRT deficient V79 Chinese Hamster cell line. Carcinogenesis, 1, 189-198. M.E. Watts, R.J. Hodgkiss, D.S. Sehmi and M. Woodcock, (1980), Rapid-mix studies on the anomalous radiosensitization of mammalian cells by 5-chloro-1-methyl-4-nitroimidazole. International Journal of Radiation Biology, 38, 673-675. M. Fox, and R.J. Hodgkiss, (1981), Mechanism of cytotoxic action of azaguanine and thioguanine in wild type V79 cell lines and their relative efficiency in selection of structural gene mutants. Mutation Research, 80, 165-185. P. Wardman, R.F. Anderson, R.J. Hodgkiss, J. Parrick, C.E. Smithen, R.G. Wallace and M.E. Watts, (1982), Radiosensitization by non-nitro compounds. International Journal of Radiation Oncology Biology Physics, 8, 399-401. R.J. Hodgkiss, and R.W. Middleton, (1983), Enhancement of misonidazole radiosensitization by an inhibitor of glutathione biosynthesis. International Journal of Radiation Biology, 43, 179-183. M.E. Watts, R.J. Hodgkiss, N.R. Jones, D.S. Sehmi and M. Woodcock, (1983), A rapid-mix study on the effect of lipophilicity of nitroimidazoles on the radiosensitivity of mammalian cells in vitro. International Journal of Radiation Biology, 43, 329-336. A.C. Begg, E.l. Engelhardt, R.J. Hodgkiss, N.J. McNally, N.H.A. 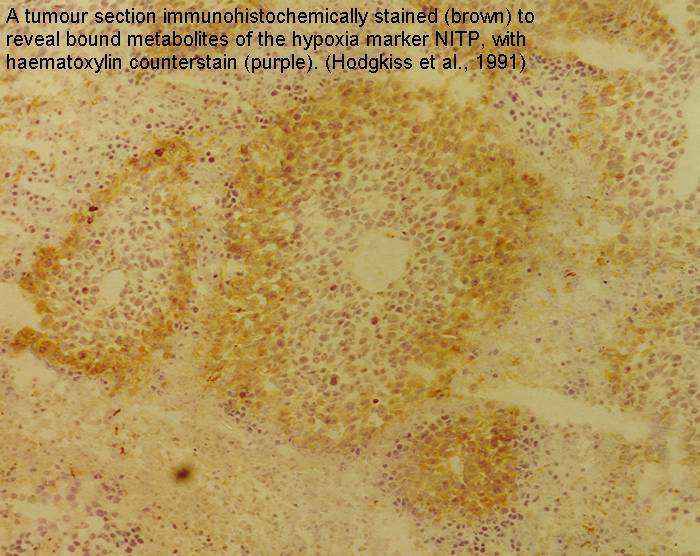 Terry and P. Wardman, (1983), Nitroakridin 3582: A fluorescent nitroacridine stain for identifying hypoxic cells. British Journal of Radiology, 56, 970-973. P. Wardman, E.D. Clarke, R.J. Hodgkiss, R.W. Middleton, J. Parrick and M.R.L. Stratford, (1984), Nitroaryl compounds as potential fluorescent probes for hypoxia. I. Chemical criteria and constraints. International Journal of Radiation Oncology Biology Physics, 10, 1347-1351. M.R.L. Stratford, E.D. Clarke, R.J. Hodgkiss, R.W. Middleton and P. Wardman, (1984), Nitroaryl compounds as potential fluorescent probes for hypoxia. II. Identification and properties of reductive metabolites. International Journal of Radiation Oncology Biology Physics, 10, 1353-1356. R.J. Hodgkiss, N.R. Jones, M.E. Watts and M. Woodcock, (1984), Glutathione depletion enhances the lifetime of oxygen-reactive radicals in mammalian cells. International Journal of Radiation Biology, 46, 673-674. R.J. Hodgkiss and R.W. Middleton, (1985), Effects of glutathione depletion using buthionine sulphoximine on the cytotoxicity of nitro-aromatic compounds in mammalian cells in vitro. Biochemical Pharmacology, 34, 2175-2178. A.C. Begg, R.J. Hodgkiss, R.W. Middleton, N.J. McNally, M.R.L. Stratford and N.H.A. Terry, (1985), Fluorescent markers for hypoxic cells: a comparison of two compounds on three cell lines in vitro. British Journal of Radiology, 58, 645-654. M.R.L. Stratford and R.J. Hodgkiss, (1986), Radioprotection by ascorbate in vitro: temperature-dependent uptake. British Journal of Radiology, 58, 83-84. M.E. Watts, R.J. Hodgkiss, N.R. Jones and J.F. Fowler, (1986) Radiosensitization of Chinese hamster cells by oxygen and misonidazole at low X-ray doses. International Journal of Radiation Biology, 50, 1009-1021. R.J. Hodgkiss, R.W. Middleton, M.R.L. Stratford and R. Del Buono, (1987), Toxicity of 3-nitronaphthalimides to V79 379A Chinese hamster cells. Biochemical Pharmacology, 36, 1483-1487. R.J. Hodgkiss, I. Roberts, M.E. Watts and M. Woodcock, (1987), Rapid-mixing studies of radiosensitivity with thiol depleted mammalian cells. International Journal of Radiation Biology, 52, 735-744. M.R.L. Stratford, R.J. Hodgkiss and R.R. Watfa, (1988), Studies on the role of antioxidants in radioprotection. Pharmacology and Therapeutics, 39, 389- 391. R.J. Hodgkiss and M.R.L. Stratford, (1988), Competitive dose modification between ascorbate and misonidazole in human and hamster cells: effects of glutathione depletion, International Journal of Radiation Biology, 54, 601-610. Richard J. Hodgkiss PhD, Michael R.L. Stratford PhD and Rodeina R. Watfa BSc, (1989), The effect of a-tocopherol and a-tocopheryl quinone on the radiosensitivity of thiol-depleted mammalian cells. International Journal of Radiation Oncology Biology Physics, 16, 1297-1300. R.J. Hodgkiss, B. Vojnovic, M. Woodcock and B.D. Michael, (1989), A single-shot rapid-mixing device for radiobiological studies with mammalian cells. International Journal of Radiation Biology, 55, 705-715. R.J. Hodgkiss, (1990), Isolation of mammalian cell variants with enhanced thiol levels after high doses of radiation. International Journal of Radiation Biology, 57, 83-95. R.J. Hodgkiss, G. Jones, T. Long, J. Parrick, M.R.L. Stratford, and G.D. Wilson, (1991). Flow cytometric evaluation of hypoxic cells in solid experimental tumours using fluorescence immunodetection. British Journal of Cancer, 63, 119-125. R.J. Hodgkiss, A.C. Begg, R.W. Middleton, J. Parrick, M.R.L. Stratford,P. Wardman and G.D. Wilson, (1991), Fluorescent markers for hypoxic cells: a study of novel heterocyclic compounds that undergo bio-reductive binding. Biochemical Pharmacology,41, 533-541. R.J. Hodgkiss, G. Jones, A. Long, R.W. Middleton, J. Parrick, M.R.L. Stratford, P. Wardman, and G.D. Wilson, (1991), Fluorescent markers for hypoxic cells: a study of nitroaromatic compounds, with fluorescent heterocyclic side-chains, that undergo bio-reductive binding. Journal of Medicinal Chemistry,34, 2268-2274. R.J. Hodgkiss, R.W. Middleton, J. Parrick, H.K. Rami, P. Wardman, and G.D. Wilson, (1992), Bioreductive fluorescent markers for hypoxic cells: a study of 2-nitroimidazoles with 1-substituents containing fluorescent, bridgehead-nitrogen bicyclic systems. Journal of Medicinal Chemistry, 35, 1920-1926. R.J. Hodgkiss, E. Kelleher and J. Parrick, (1992), Hypoxia-specific inhibition of recovery from radiation damage by a novel 2-nitroimidazole with a theophylline side chain. International Journal of Radiation Biology,61, 797-803. A. Rojas, M.C. Joiner, R.J. Hodgkiss, U. Carl, E. Kjellen and G.D. Wilson, (1992), Enhancement of tumor radiosensitivity and reduced hypoxia-dependent binding of a 2-nitroimidazole with normobaric oxygen and carbogen: a therapeutic comparison with skin and kidneys. International Journal of Radiation Oncology Biology Physics, 23, 361-366. R.J. Hodgkiss and P. Wardman, (1992), The measurement of hypoxia in tumours. British Journal of Radiology,Supplement 24, 105-110. A. Rojas, R.J. Hodgkiss, M.R.L. Stratford, M.F. Dennis and H. Johns, (1993), Pharmacokinetics of varying doses of nicotinamide and tumour radiosensitization with carbogen and nicotinamide: clinical considerations. Br. J. Cancer,68, 1115-1121. P.A. Lawton, R.J. Hodgkiss, B.P. Eyden and M.C. Joiner, (1994), Growth of fibroblasts as a possible confounding factor in soft agar clonogenic assays for tumour radiosensitivity. Radiotherapy and Oncology,32, 218-225. R.J. Hodgkiss, J. Parrick, M. Porssa, and M.R.L. Stratford, (1994), Bioreductive markers for hypoxic cells: 2-nitroimidazoles with biotinylated 1-substituents. Journal of Medicinal Chemistry,37, 4352-4356. A. Chatterjee, R.J. Hodgkiss and A. Rojas, (1995), The contribution of lethal mutations to excision assays for tumour cell survival. Acta Oncologica, 34, 493-498. R.J. Hodgkiss, M.R.L. Stratford, M.F. Dennis and S.A. Hill, (1995) Pharmacokinetics and binding of the bioreductive probe for hypoxia, NITP: effect of route of administration. British Journal of Cancer, 72, 1462-1468. L. Webster, R.J. Hodgkiss and G.D. Wilson, (1995) Simultaneous triple staining for hypoxia, proliferation and DNA content in murine tumours. Cytometry, 21, 344-351. I.P.J. Van Geel, H. Oppelaar, P.F.J.W. Rijken, H.J.J.A. Bernsen, N.E.M. Hagemeier, A.J. Van Der Kogel, R.J. Hodgkiss and F.A. Stewart, (1996) Vascular perfusion and hypoxic areas in RIF-1 tumours after photodynamic therapy. British Journal of Cancer, 73 228-293. S. Stern, R.J. Hodgkiss and M. Guichard, (1996) Comparison of two techniques for detecting tumour hypoxia: a fluorescent immunochemical method and an in vitro colony assay. Radiotherapy and Oncology, 39, 129-135. 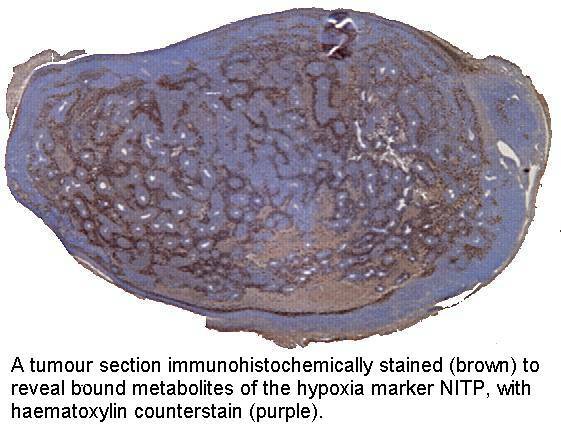 R.J. Hodgkiss, L. Webster and G.D. Wilson, (1997) Measurement of hypoxia in vivo using a 2-nitromidazole (NITP). Advances in Experimental Medicine and Biology, 428,Oxygen Transport to Tissues XIX, Editors: D. Harrison and D. Delpy. (Plenum Press, New York), 61-67. L. Webster, R.J. Hodgkiss and G.D. Wilson, (1998) Cell cycle distribution of hypoxia and progression of hypoxic tumour cells in vivo. British Journal of Cancer, 77, 227-234. A. Chatterjee, A. Rojas and R.J. Hodgkiss, (1998) Induction of lethal mutations in experimental tumours after single and fractionated irradiations in vivo. International Journal of Radiation Biology, 74, 119-127. P. Lambin, J. Theys, P. Rijken, A. Van Der Kogel, E. Van Der Schueren, R.J. Hodgkiss, J. Fowler, S. Nuyts, E. De Bruijn, l. Van Mellaert, J. Anné, (1998) Colonisation of Clostridium in the body is restricted to hypoxic and necrotic areas of tumours. Anaerobe 4, 183-188. J. Bussink, J.H.A.M. Kaanders , P.F.W.J. Rijken , P.W.J. Peters, R.J. Hodgkiss, H.A.M. Marres and A.J. van Der Kogel, (1999) Vascular architecture and microenvironmental parameters in human squamous cell carcinoma xenografts: effects of carbogen and nicotinamide. Radiotherapy Oncology, 50, 173-184. P.F.J.W. Rijken, H.J.J.A. Bernsen, J.P.W. Peters, R.J. Hodgkiss, J.A. Raleigh, A.J. Van der Kogel, (2000). Spatial relationship between hypoxia and the (perfused) vascular network in a human glioma xenograft: a quantitative multi-parameter analysis, International Journal of Radiation Oncology Biology Physics, 48, 571-582. P.O. Jensen, B.T. Morteson, R.J. Hodgkiss, P.O. Iverson, I.J. Christensen, N. Helledie, and J.K. Larsen, (2000). Increased cellular hypoxia and reduced proliferation of both normal and leukemic cells during progression of acute myeloid leukemia in rats, Cell Proliferation 33, 381-395. S. M. Ameer-Beg, P. R. Barber, R. J. Hodgkiss, R. J. Locke, R. G. Newman, G. M. Tozer, B. Vojnovic, J. Wilson, (2002). Application of multiphoton steady-state and lifetime imaging to mapping of tumour vascular architecture in vivo. Proceedings of the SPIE 4620, 85-95. P.R. Barber, S.M. Ameer-Beg, B. Vojnovic, R.J. Hodgkiss, G.M. Tozer, J. Wilson, and V.E. Prise, (2003). 3D Imaging and Quantification of Complex Vascular Networks. Proceedings of the SPIE, 5139, 67-78. P.R. Barber, B. Vojnovic, S.M. Ameer-Beg, R.J. Hodgkiss, G.M. Tozer, and J. Wilson, (2003). Semi-Automated Software for the 3D Delineation of Complex Vascular Nerworks. Journal of Microscopy, 211, 54-62. G.M. Tozer, S.M. Ameer-Beg, J. Baker, P.R. Barber, S.A. Hill, R.J. Hodgkiss, R.J. Locke, V.E. Prise, I. Wilson and B. Vojnovic, (2005). Intravital imaging of tumour vascular networks using multi-photon fluorescence microscopy. Advanced Drug Delivery Reviews, 57, 135-152.